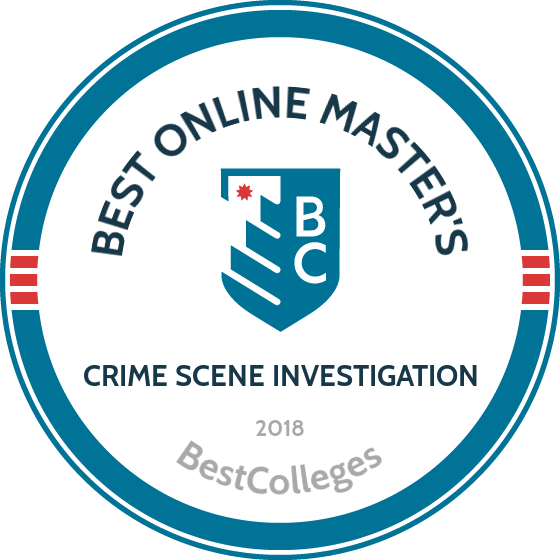 What are the Best Online Master's in Crime Scene Investigation Programs? Crime scene investigators perform duties crucial to the success of investigations. They analyze crime scenes, ensure the proper collection of evidence, take photos and create sketches, and record descriptive and statistical information. Many oversee the analysis and submission of evidence for courtroom procedures. Since evidence that is improperly prepared cannot be used in court, the duties of a crime scene investigator help ensure criminal proceedings are fair and just. With the increasing frequency of cyber crime and terrorism, many investigators are also cultivating information technology and data analytics skills. The U.S. Bureau of Labor Statistics (BLS) projects 17% growth in forensic science jobs and 28% growth for computer forensics and security analysis jobs by 2026. Both growth rates are much higher than the national average of 7%. An online master's degree in crime scene investigation equips you with the theoretical understanding, practice skills, and professional development necessary to pursue one of the fastest expanding fields in the U.S.
Home of the Gators, the University of Florida houses 200 graduate degree-granting programs. The College of Pharmacy administers the 32-credit master of science in pharmaceutical sciences with a concentration in forensic science. The curriculum develops the competencies of those presently working or seeking employment in crime labs, medical examiner offices, and police departments, among other organizations. Students take a required core that covers biological evidence and serology, forensic science principles, forensic toxicology, laboratory QA/QC, and applied statistics for data analysis. Two required courses explore special topics a the field, including a survey examining the scientific literature of that field. Students can transfer a maximum of 15 credits related to the major into the master's in crime scene investigation online. Admission requires a bachelor's degree in a science subject with a minimum 3.0 GPA, official school transcripts, and GRE scores. George Washington University’s hybrid 36-credit master of science in crime scene investigation develops learners' skills and techniques in evidence collection through online coursework and by immersing them in hands-on exercises on campus in Washington, D.C. Students focus on the fundamentals of forensic science, the science of fingerprints, digital image processing, forensic pathology, and photography in forensic science. A medicolegal death investigation course gives students a firsthand look at the medical examiner's work. They learn about autopsy procedures, child death investigation, mass disaster investigations, and how the examiner deals with unidentified remains. Students may use nine credits for electives such as bloodstain analysis, child abuse investigations, and firearms and toolmark identification. Students take a comprehensive exam to exit the master's degree in crime scene investigation. Admission requires a bachelor's degree with at least one semester of chemistry and biology. A preeminent research college in Orlando, the University of Central Florida (UCF) educates approximately 66,000 students. UCF Online gives learners access to high-quality programs, including a master of science in forensic science. The advanced forensics degree accommodates both working professionals and those in school full-time. The two-year curriculum begins with three courses examining topics in forensic science, forensic expertise in the courtroom, and quality assurance for forensic scientists. The major explores a 25-credit core covering topics like advanced biochemistry, applied molecular spectroscopy, chemometric applications in forensic science, and forensic analysis of biological materials. Students may take one of three concentrations: forensic analysis, forensic biochemistry, and forensic professional. Students opt for either a thesis or an independent research capstone to complete the master's degree in crime scene investigation. Admission requires a bachelor's degree in forensic science or another science, school transcripts, and competitive GRE scores. Florida International University enrolls approximately 54,000 students and emphasizes research as an integral part of its mission and programming. The 32-credit hybrid professional science master in forensic science combines knowledge from the forensics science and business administration programs. The 16-month cohort caters to forensic practitioners, workers in the sciences, and science educators. The master's in crime scene investigation empowers students with advanced forensic science training, management and organizational skills, and research expertise through an internship. The business aspect includes study of organizational behavior and organization information systems. The major explores areas like forensics analysis, forensic biology, laboratory QA/QC, and computer forensics. Students participate in a semester-long external lab internship; workshops also give learners hands-on experience and access to state-of-the art labs and research facilities. Admission requires a bachelor's degree in the natural sciences and a minimum 3.0 GPA. Florida's oldest Catholic college, Saint Leo University enrolls approximately 16,000 students, including numerous online learners. The master of science in criminal justice criminal investigation specialization gives professionals like first responders, criminal justice administrators, and government officials training in the investigative methodologies used to solve major crimes. The master of science in crime scene investigation focuses on sexual deviance, violence, juvenile, and environmental crimes. Students take an 18-credit criminal justice core and courses in the specialization. Required study topics include criminal sexual behaviors, criminal justice administration, investigative methodologies of violence, and the causes and controls of juvenile delinquency. A leadership applications course studies the relationship of criminal justice professions to theories of organizational leadership. During a six-credit applied project in criminal justice administration, students solve a problem or launch an initiative. Admission requires a bachelor's degree with a minimum 3.0 GPA. For colleges and universities to grant valid degrees, they need to obtain academic and professional accreditation. Two main forms of accreditation exist: regional and national. Regional accreditation indicates recognition from one of six regional organizations, depending on where the school is located. For example, a college in New Hampshire would receive regional accreditation from the New England Association of School and Colleges. Regional bodies ensure that schools meet state-focused academic and institutional standards. Employers usually prefer regional accreditation because they often deal with state authorities and regulations. Schools earn national accreditation from organizations with approval from the U.S. Department of Education (ED) and the Council for Higher Education Accreditation (CHEA). The ED and CHEA are the most important education oversight bodies in the U.S. They not only oversee national accreditation through their direct subsidiaries, but also bestow power to regional accrediting organizations. As a government entity, the ED provides federal funding and other crucial resources to schools who align their institutional goals to match national standards. Established in 1996 as a private nonprofit, CHEA advocates for its 3,000 member institutions through lobbying, research, and educational initiatives. The council also enforces standardization among its cohort. For more information on nationally accredited online master's in crime scene investigation programs, visit the ED's and CHEA's website. Ideally, you should enroll in a college or university that holds both regional and national accreditation. Master's in crime scene investigation online programs can also possess specialized accreditation from organizations like the Academy of Criminal Justice Sciences and the Forensic Science Education Programs Accreditation Commission. The table below uses information from PayScale to detail salaries for five possible careers you can pursue upon earning an online master's degree in crime scene investigation. Unsurprisingly, pay increases as you gain more work experience. Education also affects salary, especially for careers that require particular training such as advanced legal knowledge and information technology skills. Location can also pay a significant role in pay rate. By pursuing a master's in crime scene investigation, you open yourself up to several impactful and lucrative careers in law enforcement and forensic science. Crime scene specialists can choose to pursue team-oriented positions as probation officers or forensic scientists, or opt for more self-directed jobs as private investigators. Regardless of where they work and what specific roles they occupy, crime scene investigators possess exceptional attention to detail and the ability to collect and assess complex information. Usually working for the government, probation officers provide social services to help rehabilitate law offenders on parole or probation. The job usually entails a lot of field work in high crime areas. To handle possible dangerous scenarios, probation officers undergo specialized training on top of earning a college degree. Also known as detectives, these criminal investigators often work as free agents. However, they can also take up positions in police departments and government agencies. Investigators search for information regarding personal, financial, and legal matters to solve cases of missing persons, fraud, violence, and computer crimes. Private investigators usually hold a college degree, but gain most of their skills through field experience. With the option to specialize in crime scene investigation or laboratory analysis, forensic science technicians gather, assess, and prepare evidence for trial. They also collaborate with professionals like toxicologists and odontologists to ensure accuracy. Most technicians hold at least a master's degree, though positions are available for undergraduates with an adequate amount of additional professional training. These professionals develop and implement security practices that safeguard an individual's or entire corporation's sensitive data. In a crime scene investigation context, information security analysts collect electronic evidence and pursue cyber criminals. In addition to an advanced college degree and training, these specialists must stay abreast of the latest developments in computer and internet technologies. While you complete your online master's in crime scene investigation, you should investigate professional organizations in the field. Professional organizations strengthen job prospects by providing additional guidance, resources, and institutional services. Membership in these organizations usually requires an annual fee, but in return you gain access to a network of peers ready to collaborate on research and work opportunities. Professional organizations also host conferences, scholarships, and skill development opportunities such as the on-site training sessions hosted by the Association for Crime Scene Reconstruction. One of the oldest and most respected organization in the forensic science field, IAI boasts nearly 8,000 members from 77 countries. Membership benefits include job listings, research opportunities, training programs, and certifications. Founded in 1991, ACSR supports research and policy initiatives that benefit the field of crime scene investigation. Members gain access to a library of topic-specific literature, conference discounts, and professional training programs. AWIFS supports female crime scene investigators and forensic scientists by connecting them to job opportunities, training programs, and financial awards. The association stands out not only for its emphasis on women in the field, but also for its community and youth engagement. ACJS supports criminal justice professionals by hosting professional and scholarly resources, including certification programs and publication opportunities. Members can also access grants, awards, and an expansive employment bulletin. AAFS was founded in 1948 as an organization for forensic professionals, including anthropologists, document examiners, psychiatrists, attorneys, and chemists. Today, AAFS represents over 7,000 members. The organization provides access to networking events, research journals, and other professional resources. Students benefit from AAFS's academic awards, summer camp, career guidance, and placement services. As you research master's degree in crime scene investigation programs, make sure you think about affordability. The Center for Financial Inclusion cites a staggering 74% increase in U.S. student loan debt between 2004 and 2014, resulting in negative consequences for both individual students and the national economy. However, there are several funding resources that you can use besides loans. The Free Application for Federal Student Aid (FAFSA) allows you to sign up for several awards simultaneously. You should also look into scholarships through community and professional organizations, including these opportunities from the Johnson-Whyte Memorial Foundation Fund.